Welcome to what I believe will be the final guest blog post on representation in SF/F. In addition to working on Invisible 2, I also plan to put together a round-up of links to all of the guest articles, and if I can make the time, to pull together a reading list as well, based on comments and conversation around the posts. In the meantime, my thanks to Kat Tanaka Okopnik for bringing us to a close with her personal and powerful piece about seeing your own children shaped by problematic tropes and stereotypes, and the urgent need to do better. Before you read further, indulge me please. Picture, if you will, a young (East) Asian American protagonist. If you can, do a color drawing, or write down your description. If you feel ambitious, please do the same with White, Black, Latin@ friends for them. What made that character seem plausibly East Asian to you? Was it the golden skin, and the tilted eyes? Where do they live? What do they eat? Where did their parents grow up? I hate writing this essay. I wish there wasn’t such urgent need to write it. I wish I were writing about it in the past tense, rather than as a pressing need that I’m finding exhausting. I have two young children who are surrounded by media that are leading them to perform the very same problematic tropes about (East) Asians that I grew up around. It’s 2015. Aren’t we supposed to be done with this? I wish all the blithe pronouncements of our colorblind, postracial society were real. I wish there were actually enough mention, by other people, of the issues facing Asian America so that I could write sense of wonder stories instead—but my child has said to me, “Mommy, my skin is ugly!” Further discussion reveals that he’s come to think of lighter and darker skin than his own as beautiful, but his light olive is unacceptable in his mind. I spend months working even harder to make sure that people who look like him are presented as attractive, too. It’s a rare week when I don’t see yet another case of yellowface and exoticization of East Asians dismissed as a non-issue. The excuses are predictable: it’s historic, it’s satirical, it’s humorous, it’s tribute, it’s realistic, why do we complain when there’s representation? it’s not just East Asians! actually it’s punching up, hey my Asian friend said it was okay, oh it’s someone East Asian doing it. I’m known to have an interest in finding non-problematic media, and so I’m offered a pretty steady stream of recommendations. The majority of “diverse” stories and shows that are offered to my children come in two categories: East Asian kid as a member of the tokenized team of sidekicks to the white protagonist, or stories of East Asia or the recent diaspora. Often, the indicators of East Asian identity for the team player are an East Asian-language name and “golden skin and straight black hair and slanted eyes.” There’s a parent or grandmother who speaks in fortune cookie Wise Oriental proverbs. Unfamiliar words are dropped into the conversation, with an echoed translation into English immediately afterward. They’ve been taught by the culture around them that “Chinesey” is a performance based on wearing cultural artifacts, and that East Asians are defined by accents and tinkly background music. There’s a continuum from Tikki Tikki Tembo through The Runaway Wok and The Mikado that portrays Asia as a place of silly sounding names and illogical people. And yet these are the things that well-meaning educators are presenting to them and their peers. I can work hard to give my children a healthy sense of belonging and potential, but I can’t change the world they’re interacting with on my own. It’s their peers’ sense that Asianness is defined by otherness that causes me the greatest concern. Now that they are reading fluently, I wish I could just hand them an age-appropriate book. Where’s the “Heather Has Two Mommies” of cultural etiquette for the single digit set? It may be out there, but it’s buried under the pile I review and reject for my children. I know we can do better as a society. ​​Kat Tanaka Okopnik started writing about Japanese American history at age 13 and has gone on to write about geek culture, food, parenting, social justice, and stepping outside the confines of narrow social expectations. She’s pleased to note that she has an essay forthcoming in WisCon Chronicles 9. Her current big project is the Dictionary of Social Justice. She’s available as an editor, copy editor, and writer, and offers private consultations and group encounters on facilitating difficult discussions on social justice topics. 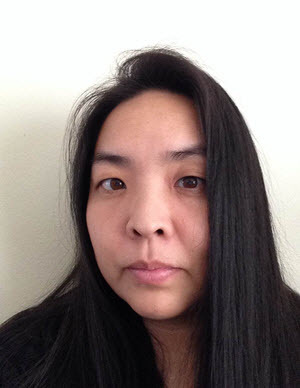 She also does cultural consultation for writers, editors, and others on East Asian representation, with a focus on Japanese diaspora history and contemporary issues as well as for general social justice pitfalls.